This is the decal logo badge that goes in the center of your steering wheel. 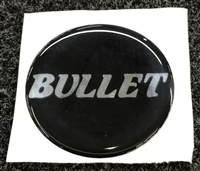 This is the replacement center cap for the 3 spoke style steering wheels, typically found on the "X" series boats, the Bullet decal is featured in the center. 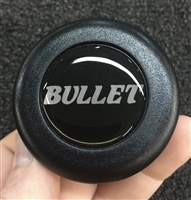 This 3 spoke design will fit any model of Bullet boat, it provides the classic Bullet look at a great price point. Comes in Black with silver spokes, center cap is included. 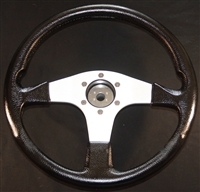 This steering wheel is a true work of art and an item that will bring another "WOW" factor to your Bullet boat. Although this is standard equipment on the XRS, SS, SDC, and SST it will fit all models of Bullet Boats.